Who gave you permission to make this guitar in "Metallic Bordeaux"?!!! Not this decade. And probably not the next. But it's awfully desirable! Maybe with different pickups.... A T-Armond T-90 combo? I always wonder why he doesn't tweak the neck angle to allow for a non-tension bar bigsby. The Spectra Sonic Supreme really is a wonderful instrument. I'm very happy with mine. The Spectra Sonic sure looks cool. I like the Model 10 as well and it's more in my price range. Is that "translucent red" or "metallic bordeaux"? Never played the TVJ myself but my experience has been (w/ ES 335) that B7's work much better when there is more distance from the bridge to the roller bar which results in a much less severe break angle unlike a Les Paul, etc. That's the translucent red (with some nice flame underneath). I love the big ol' 16" body on that model. It's freaking huge for a solidbody instrument. I know, but like chambered Jet models, it still gives the appearance of being a solidbody. Thanks for making that clarification, though. The SpectraSonic Supreme is a perfect guitar (and I don't use the term lightly). As great as it looks (and GGiH, it looks), that's only the icing on the cake. The cake is that every detail from scale to body construction to wood choice to neck radius and feel to headstock angle to pickup choice to control scheme (and Bigsby) are perfectly chosen to work together seamlessly. It's what a Brit would call "completely sorted," a hip yankee hillbilly of a certain age might call "copacetic." The story of the guitar isn't how fully-featured it is, it's how smoothly it delivers what it does. Using the freaking tone control, fergawdsake, is a borderline religious experience: not brittle bright when wide open, not unusable mush when zeroed, and smooth taper all the way down. You can actually find the gradation of tone you're looking for. You wonder why "just" TV Classics when the man has so many other pickups to choose from. The answer is "I don't know. Just play the thing." Anything else would be too bright, too hot, too thin, too fat: the Classics are just right. 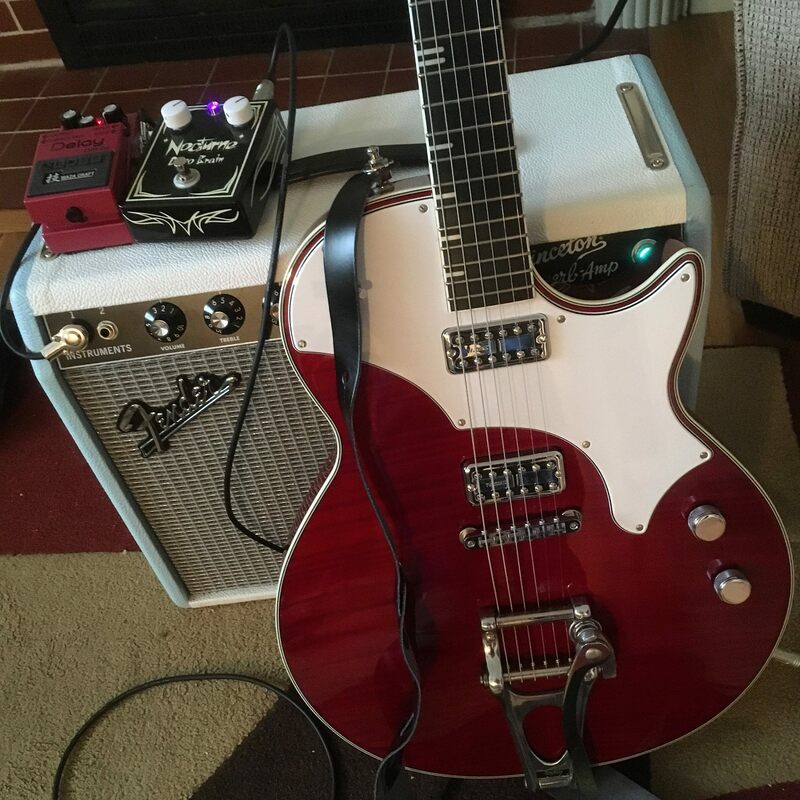 It's not a guitar that does everything: it doesn't replace a full hollowbody, it's not a Tele or a Strat, and it's not a Dyna box (man, I'd love to hear that combination). But pretty much everything else you'd ask of a "solid" (chambered!) 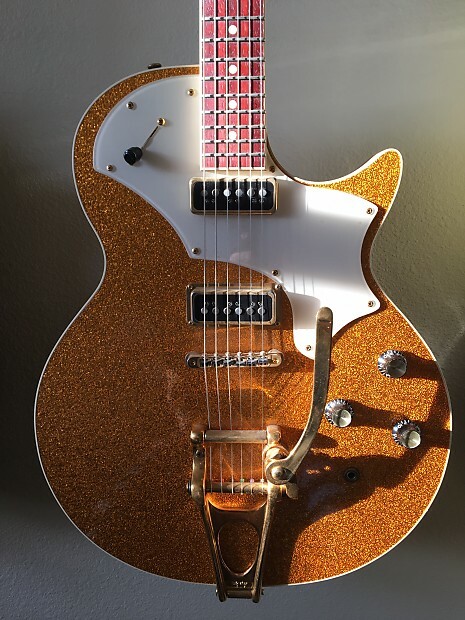 body electric guitar...it does - while maintaining a distinctive tonal character of its own. I shouldn't admit it, but I haven't even replaced the bridge on mine. Maybe a stainless or titanium SerpenTune would make even perfecter - even most perfectest. But it's hard to upgrade a superlative - and it gets "more uniquely" ungrammatical even to try - so I haven't. Another confession: I'm not crazy about the "spaghetti" fret markers. But I'm pleased and proud to sport the TV Jones logo on the headstock. Gosh, these are great guitars! I really like them but I also wonder why TV Jones don‘t gave her an angled neck for a non-tension bar Bigsby. Well, again...I'm not a fan of tension-bar Bigsbys, but on this guitar I don't even notice it. I just notice that it feels and works fine. Yesssss!!!!! I would totally rock the hell outta that thang. My SS had a Ti Serpentune on it and was amazing. Try one. The guy who makes them has a link on this page. Tell him you know me. That S-O-B! I can't afford that! It doesn't happen often but deals on used TVJs do happen. I got the one I shared above from a Guitar Center in Los Angeles in Exc+ condition for an amazing deal (I don't think they really put a lot into what it was worth when they listed it). The one I used to have is a Dyna box! Wow! Looks cool with a gold sparkle. Waddaya mean, you USED to have? What could possess an individual to part with such a confection? Where did it go, and can you get it back? Man. I should like to have such a guitar. Here ya go (he, he, he).